Is your current XK8 / XKR interior looking tired and in need of a change ? 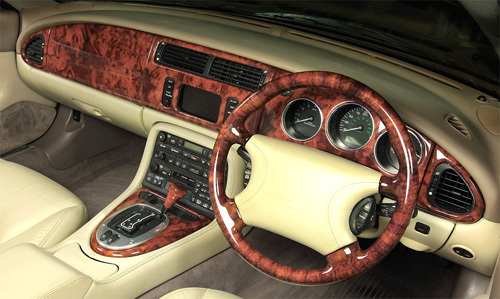 We can now supply a Jaguar XK8 / XKR Original Equipment Walnut Veneer Wood Set RHD or LHD and either with or without satellite navigation. This wood veneered set is made with the same piece of veneer to ensure total continuity and a symmetrical finish of the highest quality. Only the finest burr Walnut veneer is used, finished with high gloss polyester lacquer. Price does not include steering wheel in burr walnut which can be purchased separately. Prices exclude UK VAT @ 20% and shipping. If you live outside the UK then ‘NO’ UK VAT is payable. Prices correct at publication date. We can now supply an XK8 / XKR Original Equipment Carbon Fibre Dash Set RHD or LHD and either with or without satellite navigation. Price does not include steering wheel in black graphite which can be purchased separately.